On Caro Daur: The Elder Statesman Cyclone Dyed Simple Crew ($1185); Chanel bag and earrings. I’m just going to come out and say it. Sometimes, I just love looking at pretty things. I get a rush from it. Sure, shoes do it for me, but it’s a beautiful bag that really gets me going. So today I wanted to share with you some of the most gorgeous designer bags I’ve seen yet this season to get inspired. The stunners coming your way range in silhouette and style, but they all have one thing in common. Yep, each beauty will add a fashion-forward flair to anything you’re wearing and make it an outfit to remember. Ahead, feast your eyes on the prettiest investment totes, clutches, and shoulder bags of the season from brands like Gucci, Loewe, and Chanel. While many of the price tags may certainly be out there, a little eye candy never hurt anyone, right? 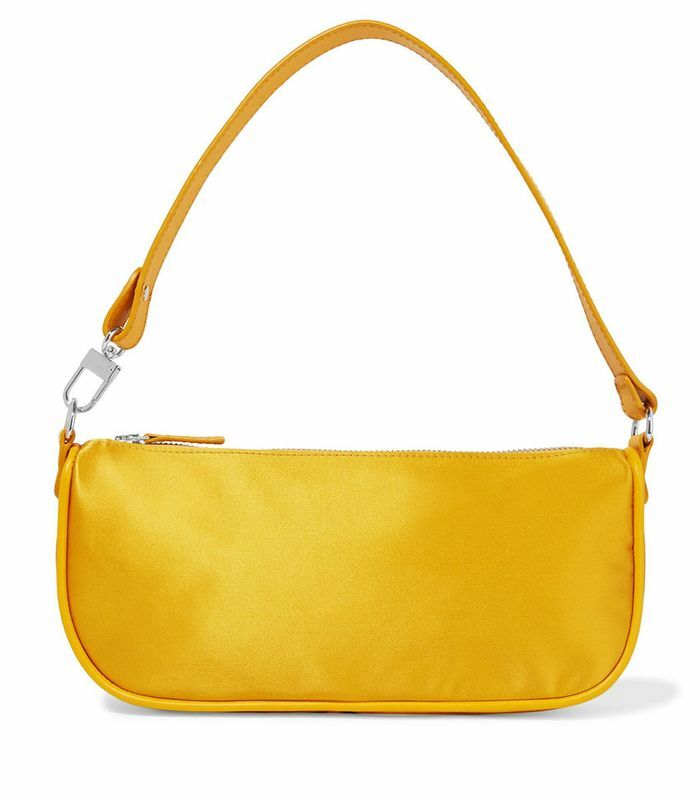 The latest iteration of fashion's favorite mini bag is beyond gorgeous in electric silk. The style set is all about Loewe's latest crossbody style. Make a power move with this It handbag in fiery red. While unique in shape, this bag feels classic enough to use for seasons to come. Celebs continue to embrace the Balenciaga graffiti collection. While this Chanel beauty launched last year, it will always be a favorite of mine with the gorgeous rainbow coloring. Chloé's new logo bag is an absolute must-have this season. The mixed fabrics and offbeat shape are drawing me to Rejina Pyo's latest bag. The new Prada shape in black and white is so timeless. Who hasn't been into the resurgence of the Dior saddle bag? Exactly. Perfect for commuters, this backpack is sleek and forward for dressed-up vibes as well. Animal print is still everywhere this spring, so jump on the trend with a stylish bag. You'll be able to fit your entire life in this stunning suede tote. The fashion crowd won't stop carrying bags from Wandler, and I have a feeling this icy-blue pick will be a huge hit this spring. You can never go wrong with a Burberry checked bag. Enough said. Go hands-free and keep it stylish with one of Gucci's new pretty crossbody bags. Love a bucket bag? Go for the wow factor with this cool blue style. If you need something fancier for formal affairs, consider this alternative satin clutch that feels different and chic. A multi-hued box bag will add spice to anything you're wearing. Next, check out the designer It bag that's popular again after 10 years.